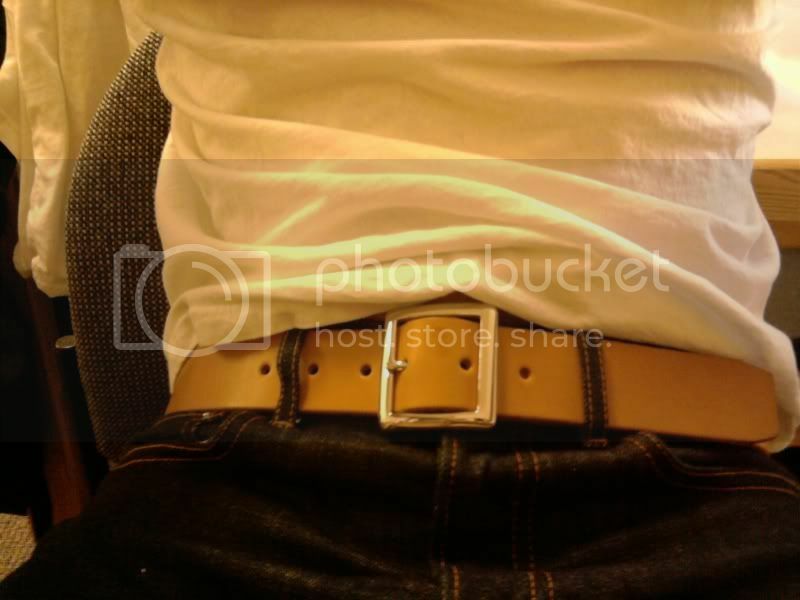 you can see the belt has already darkened a fair amount, especially at the edges. i regretfully forgot to snag macro pics of the buckle edges, where it is already beginning to dull to that beautiful matte finish you see on rnrswitch's above. also of note - mine does not have the leather keeper loop that his does. center bar buckles do not require them, but i think LGC will include it anyways upon request. for the nitpickers: from spring 2006, 36x34 TTS, pre-soaked, no washes, 4 months wear, umm... think that about covers it, haha. 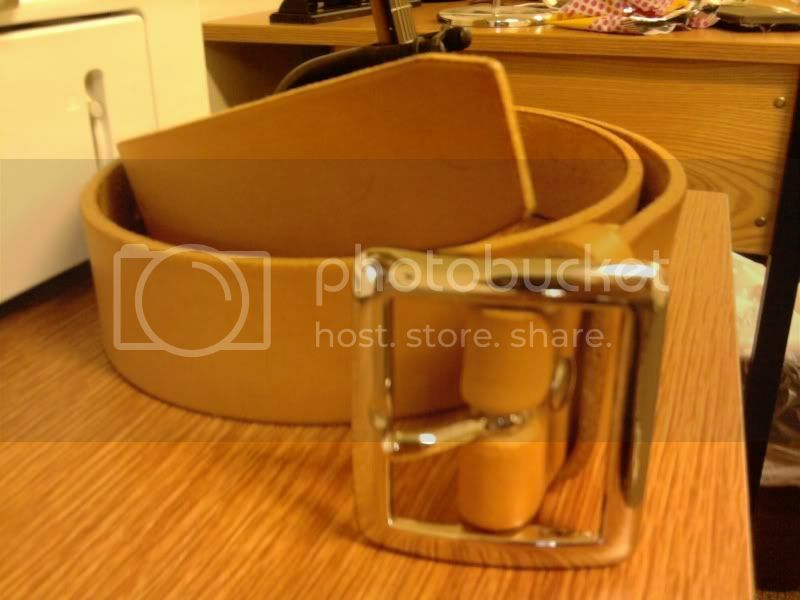 does anybody know a good online store that sell filson belts, and also ships internationally ? I'm pretty sure Crane's will ship anywhere, and they also have a Styleforum discount code for all Filson stuff, 'SFFilson1' for 15% off. They're cool folks, and they offer some nice gear. I just ordered a hat and some long underwear. 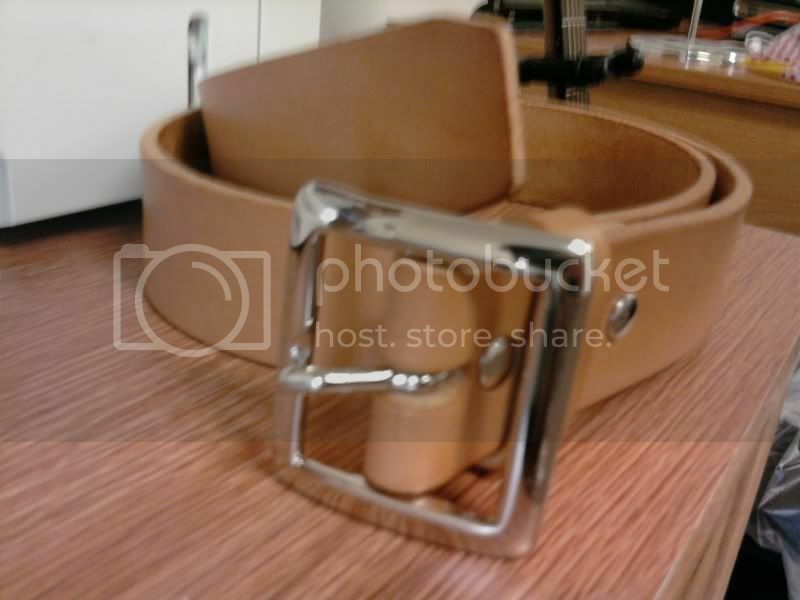 just got my LGC 1.5" Bridle Natural tan with nickel garrison buckle from Bill. wow i love it. its perfect. I requested him to square off the end and cut off the corners like tallyho's. He also included an extra loop for if i decide to change buckles. 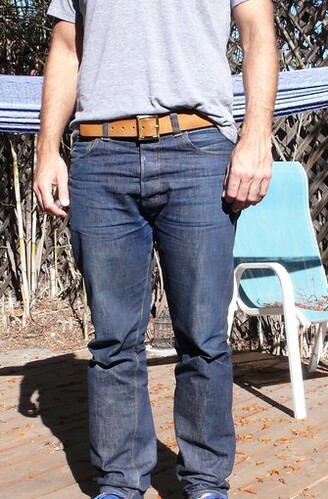 i need to pick up one of these lgc bridle belts soon. so nice. just ordered my lgc belt... can't wait... .will post pics when it gets here. anyone got any advice to clean up my belt, because I have a silver buckle and started out using the second hole, but by now I'm using the third hole and the silver buckle has left a nice 'black' mark on the belt where it used to sit, should I just use saddle soap or different stuff to clean it off? and in the case of saddle soap, how do I best go about this? i don't have any experience with your specific problem, but i'm pretty sure saddle soap is the the only real option. you can find it almost anywhere, and the directions on the can are very simple and straightforward. iirc, you just take a slightly damp cloth and massage the soap into a little lather then rub it on the leather. this may or may not remove what you're trying to get off. i wouldn't worry about it too much anyway though. 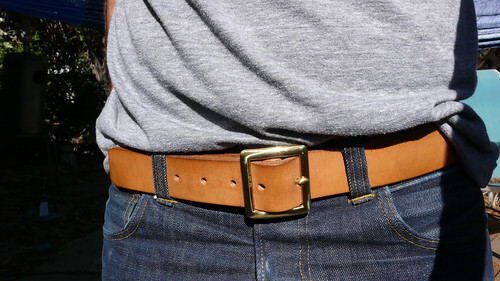 gives your belt some character! Placed an order for a LGC belt last night! Cant wait for it to get here. Will post pics when it arrives. Top one's lovely. Any info? Got my LGC Belt in the mail today. Absolutely love it! Bridle Leather, Buckle #3 in nickle, size 34. ^how'd you get it before me? what type of leather did you use? do you make other leather goods as well? Is it one of those tandy kits? It looks pretty good man. This thing is going to last longer than me. My belt,hand made by a cool friend . All silver with elephant leather. Just got this in my e-mail and saw it posted on some other forums. Copy and pasted for your consumption. Good deal for those of you in need of a belt. Hope this email finds you well. We've been busy gearing up for the holiday season, and wanted to pass along an invitation to take 20% off any Tanner Goods purchase from November 27th through December 1st. We only offer a discount on our goods once a year, so if you've been contemplating picking up a new belt or wallet for yourself or one as a gift, now is a great time. When checking out at our online shop, simply enter the promotional code TGBLACK and 20% will be taken off your total. In addition, we will also be offering a complimentary set of beer coasters for all orders over $100. These are cut from heavyweight 8/9 oz natural strap leather, and feature our mallet makers mark stamp. Watch it age with every beer. 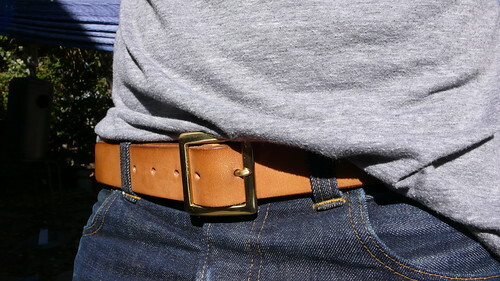 We've recently added a new color to our Standard belt lineup: Mahogany. This deep wine-colored English Bridle leather is a nice autumn / winter hue. Available with nickel or black hardware. Hope you all have a great weekend....thanks for your continued patronage! 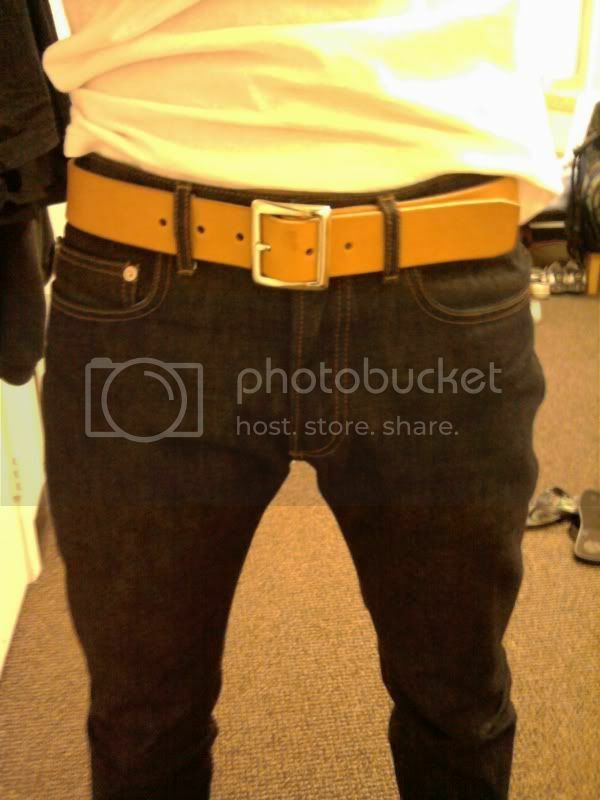 Dam jackandcoke that belt looks good, I like the shine! nice! i think i might buy me another tanner belt with this deal.